What Will Mnangagwa Use as a Carrot for Opposition's Chamisa? Sports Minister Kirsty Coventry (file photo). A developmental Cabinet, I would call it. Brilliant balance between old and trusted hands, technocrats and youthfulness. A well thought out Cabinet that balances the competing demands of the economy and politics. The appointment of Oppah Muchinguri-Kashiri as Defence minister is a masterstroke. This ministry was being watched by many following the events of August 1 in which the deployment of the army on that fateful day is now the subject of a commission of inquiry. Muchinguri-Kashiri, a war veteran in her own right, is being deputised by Cde Matematanda, who is also a war veteran. The command of the army is in safe hands. The appointment of Joel Matiza, an engineer by profession, and Fortune Chasi, a lawyer by profession, to the Transport and Infrastructural Development Ministry takes care of the legal and technical aspects of the roads we need to build in double time. The Beitbridge road that was bogged down before due to contractual enforcement comes to mind. This combination of legal and technical expertise will go a long way in getting things done. No surprises on the re-appointment of Dr Sibusiso Moyo to the Ministry of Foreign Affairs and International Trade. He has made considerable inroads since November last year in the world of diplomacy. His job was always guaranteed. Winston Chitando, reappointed to the Mines ministry, is a former Mimosa Mines boss and hence a technocrat. His is perfect in his role. Surprise new names unknown to many are industrialist Mangaliso Ndlovu to the Industry and Commerce Ministry and Dr Obadiah Moyo to Health and Child Care Ministry. A renowned medical professional, Dr Moyo has singlehandedly built a state-of-the-art hospital in Chitungwiza. He will most definitely look to turning around the health sector and not wait for budgetary allocation to do this. This man understands that the health sector is not Government responsibility alone. The private sector and indeed all citizens the world over have a role to play. Sithembiso Nyoni, despite her age, is the face of experience and energy. She has in the past excelled in Women's Affairs and Small to Medium business development. She brings a wealth of wisdom and experience to women's affairs. Her compatriot, Priscah Mupfumira, has been a steady pair of hands in the tourism sector. I have had occasion to interact with her here in London. She brings maturity and trust to a key ministry. She is part of the old guard. Her compatriot, Joram Gumbo, former Transport minister, is now in charge of the Energy and Power Development portfolio. His track record in the Transport ministry is not impressive. He is accused of presiding over non-performance of a contractual obligation on the Beitbridge road and is largely tainted by allegations of corruption in the Air Zimbabwe/Zimbabwe Airways aeroplane acquisitions. However, no evidence of any wrongdoing was ever brought forward. "Kazembe where are you" inherits Supa Mandiwandzira's ministry in ICT and Courier Services. A welcome change considering the drama at NetOne amid allegations of corruption and sleaze between Supa Mandiwanzira and Reward Kangai. Kazembe Kazembe was in the Youth and Sports ministry in his past life. Remember him, the guy given a verbal shower by Dr Amai for working against Kasukuwere. Air Marshal Perrance Shiri remains the face of Command Agriculture and has done well in this area and now incorporates Command Cattle Ranching, Command Dairy and many other command initiatives that will see Zimbabwe becoming less and less reliant on food imports. He is well on track to restoring the breadbasket status of Zimbabwe. Cain Mathema is a former junior ZAPU official and took over the governorship of Matabeleland North and Bulawayo in the past. He continues with tradition of former ZAPU politicians after being appointed to head the Home Affairs portfolio. He is a traditionalist. He never misses an opportunity to promote cultural norms. Sekai Nzenza is a seasoned development and cultural expert who has been a columnist for The Herald newspaper. She is also a trained nurse who won the Chikomba East constituency. A prolific writer, she brings a wealth of international experience to the Public Service, Labour and Social Welfare ministry. July Moyo bounces back in a mercurial rise as the Local Government, Public Works and National Housing minister. He is a passionate proponent of devolution of power to the provinces. His ministry is key as it is the point of interaction with the opposition local government structures. He is on record as saying he has his hands stretched and wants to give all Zimbabweans the opportunity to build their country. His hands are also full with the ambitious project of trying to house everyone. Professor Amon Murwira is your typical academic and technocrat. He has links with both industry and educators. He was brought in after the transition in November last year to replace Professor Jonathan Moyo, who fled into exile and his whereabouts officially remain unknown. One of the biggest interventions is that he secured a loan facility to assist tertiary students. Professor Paul Mavima, my former tutor at the University of Zimbabwe, was brought in to clean up after Lazarus Dokora and has done a wonderful job that he has been re-appointed to head the Primary and Secondary Education ministry. His ministry is key as it will define Emmerson Mnangagwa's lasting legacy. Information, Publicity and Broadcasting Services is now led by Monica Mutsvangwa, the wife of Christopher Mutsvangwa. A war veteran in her own right, she is a senior party leader in Manicaland. She worked as a diplomat in Namibia, Australia and USA. She is deputised by the mercurial Energy Mutodi, a Harare businessman, sungura musician, politician and academic. Kirsty Coventry, a former swimmer and world record holder, and the country's most decorated Olympian. She is the new Minister of Youth, Sport, Arts and Recreation. 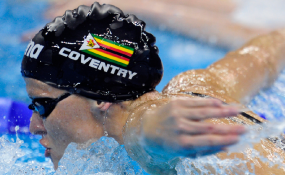 A white Zimbabwean who could have represented other countries during her swimming career but chose to remain true to her country, Zimbabwe. She is a true nationalist, in good times and bad times. When other Zimbabweans were abandoning their country, she still went to the Olympics wrapped in the Zimbabwe flag with pride. There were times when she didn't have resources for training, but she still refused to take offers from other countries. Her friendship with Princess Charlene of Monaco could be handy in inspiring the youth of Zimbabwe. Last but not least, Professor Mthuli Ncube, a respected international economist who has worked at some of the most prominent institutions in the world. Educated at Cambridge, he has been until his appointment a professor at Oxford University. He has lectured at the London School of Economics and in addition to being Dean at Witwatersrand, South Africa. He comes in with great respect and expectation because the success of President Mnangagwa's Government will rise and fall on his ability to move in quickly and stabilise and grow the economy amid the challenges of a non-existent currency. Professor Mthuli Ncube is coming in to sit in the middle of "Operation Revive Zimbabwe". So, this Cabinet is a good start for President Mnangagwa; he has proved that he is a listening President, he has brought in new faces as he promised. He has for the first time promoted a woman to become Defence minister. He has brought in a lot of young people. He has succeeded in silencing even his most fierce critics. A great leap forward for Zimbabwe, even the markets are jumping.